The past few days we have been sailing straight through the intertropical convergence zone (ITCZ). Although we are still around the eighth degree latitude and not yet to the equator, we are experiencing its effects of constant cloud cover and frequent heavy squalls, especially at night. 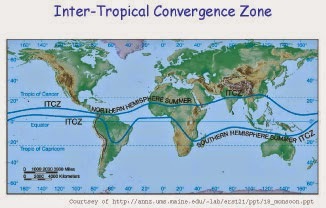 Theoretically the ITCZ exists in a band around the equator, but because of the declination of the earth, it can move northward with the sun in some locations as the slightly more northern water becomes hotter. The squalls have not been as constant, the rain relatively light, and we have seen even a little sunlight considering what can occur in the ITCZ, so we consider ourselves lucky. 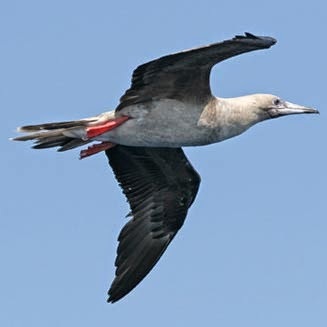 The other notable change to our surrounding has been the appearance of boobies, specifically red footed boobies and a few masked boobies. Boobies are large seabirds that plunge into the water to catch fish, with striking plumage and colorful body parts. They don't go as far out into the open ocean as the petrels and shearwaters we had seen earlier in our voyage, so their presence indicates the presence of land nearby, which in this case in likely Palmyra Atoll to the east of us. As we continue to progress toward the Phoenix Islands, we will start to see a lot more seabirds, including some smaller groups that don't venture out as far away from their breeding grounds. 19 different species of seabirds breed on the Phoenix Islands across the eight islands in the group. For many of these species, including the endangered Phoenix petrel, the Phoenix Islands represent one of their primary breeding grounds worldwide. These small islands house tens of thousands of breeding pairs of many seabird species, including over 600,000 breeding pairs of the sooty tern on Orona itself, one of the four islands we plan to visit. Historically, the Phoenix Islands are home to a limited variety of terrestrial animals: these 19 species of seabird, a few migratory shorebirds, hermit crabs, and some lizards. The absence of mammals was crucial for the success of the seabird rookeries, as many of them have low-lying nests, burrows in the ground, or nest on the ground. Without mammalian predators they thrived on these islands. However over the past few centuries, with increased sea travel and exploration, rabbits, rats, and cats have all been introduced to the islands. They prey on seabird chicks and eggs and compete for the limited habitat available on the islands. Seabird numbers plummeted as a result, with the ground nesting species especially hurt, with some of them only breeding on a few tiny spots of land in lagoons in some of the islands where the mammals couldn't reach. So while the current numbers of breeding pairs of birds seems high in the Phoenix Islands today, it is an order of magnitude or two lower than historical numbers. Efforts have been made to get rid of these invasive species and help the seabirds recover from their impact. In 2006, rabbits were removed from Rawaki, and Asian rats from McKean, leaving these island completely free of invasives. A more extensive project was done in 2011 to remove Pacific rats from Birnie and Enderbury. Reports from Rawaki and McKean showed a huge success in the quick increase in breeding pairs on these islands, especially in the most sensitive species. One of our main projects in the Phoenix Islands will be checking in on the results from Enderbury and hopefully will see an increase throughout the whole PIPA area as the spread out. Good information and good works.